V e g a n D a d: The Bakery is Open! I finally did it. 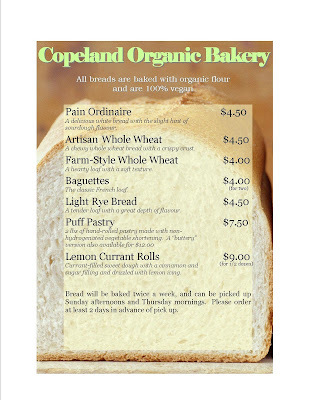 I started a very small organic bakery in my home where my customers are friends and neighbours. This was an idea I toyed around with after doing an insane amount of baking for the street fair at the boys' school. Since I still have a real job, I bake twice a week--it is a great way to relax and decompress after a day of teaching. Since Wednesday night is a baking night, I won't always have a blog post for that day (as you probably noticed yesterday). But I am sure you can all get along without me.